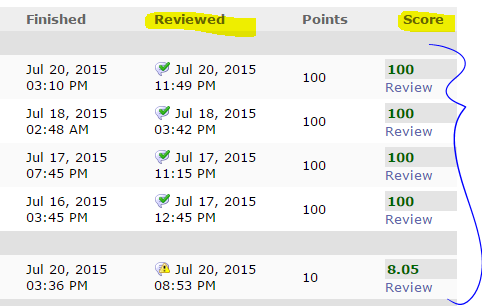 When you click on a student’s name, you get a summary of all of their scores and grade. This view is almost identical to what students see. Grade to Date: 59.0 out of a possible 66.0 points graded and released (B / 82.0%). Total Score: 424.5 out of a possible 500.0 points for the entire course (B / 84.9%). Below the summary, you can see each student’s graded and released submission per assessment. The information is organized by assessment type or custom categories, as per your setup. For each assessment, you can see the open and due date, when the student submitted each, their score, and whether or not he or she has reviewed your feedback. To export the detailed summary of a student’s grades in all assessments, click on Export to CSV. To navigate to the next or previous student, click on the arrows. To access the student’s graded submission for an assessment, click on the “graded” icon by a student’s score. You will be taken to the submission in AT&S or Discussions. After you regrade it and click on Done, and you will be returned to where you left off in the gradebook. If you allow multiple tries in one ore more assessments, and you want to see all of the student’s submissions, you can do so by clicking on “View or Grade All Submissions”. This will allow you to view all of the student’s submissions – graded, released or unreleased, and in-progress. From this view, you can enter or adjust scores for any submission, and release scores. You may also click on the graded icon to go directly to a student’s submission in AT&S or Discussions to review it, add feedback and a grade. Upon clicking on Done, you are returned back to the gradebook. When entering or adjusting a student’s scores from the gradebook, the scores are updated in AT&S or Discussions at the same time, automatically. Much like instructors, students can go to their submissions from the gradebook and see how they did, read their instructor’s feedback and breakdown of points, as appropriate. To do so, they click on Review. This feature allows students to access your feedback from the gradebook, in addition to Course Map, AT&S, Discussions, Dashboard, and Home Page. Here is the students’ view of the gradebook. They can see when they submitted their work, how much it is worth, if they have reviewed your feedback. The instructor’s individual student view is almost identical to that of students. Instructors have access to the same grade report data that students have in their gradebook view. The only difference is that instructors have grading capabilities, can export data and navigate to other students’ records.